I’m a big fan of the salad kits at Costco. You know what I’m talking about — the Sweet Kale one and the Asian Crunchy one? 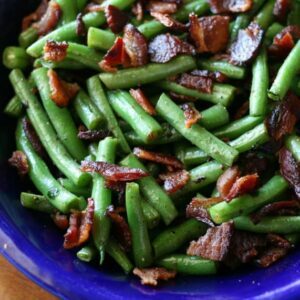 They’re great when you need a side dish or a potluck offering in a pinch. And everyone loves them. BUT. I’m a stinker when it comes to oils. The dressings in those salad kits are soybean oil-based, and it makes me cringe on the inside when I eat them. Vegetable/canola oil is no better. If I was going to start a new business I’d make salad kits with healthy dressings — ones with extra-virgin-olive oil or avocado oil as the base. If you’d like to steal that idea and run with it, let me know how it goes. I’d just like free salad for life, please. 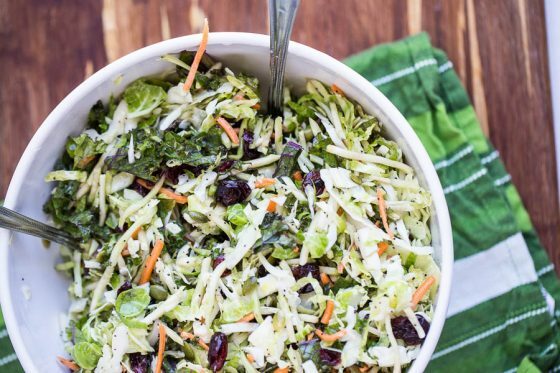 One of my favorite things about this salad is the use of hearty greens and shredded vegetables. 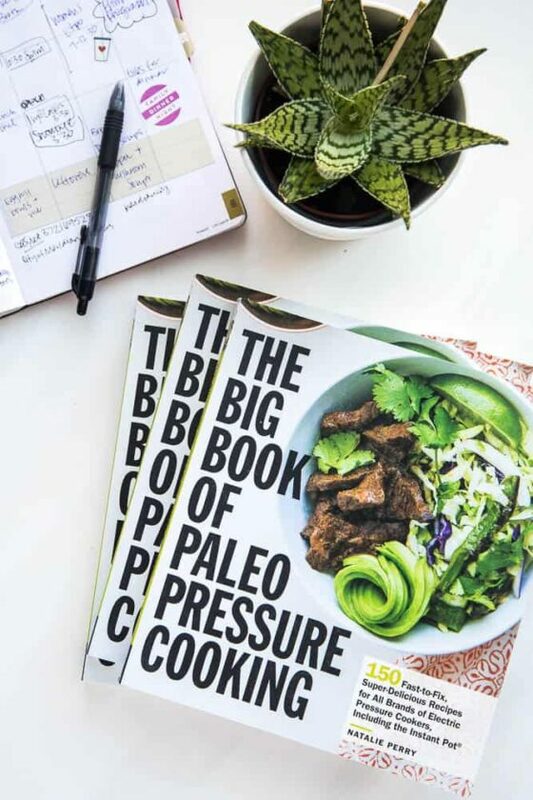 You can dress the salad, stick it in the fridge and eat it the whole week and it won’t go limp and slimy like dressed Romaine or another lightweight lettuce. 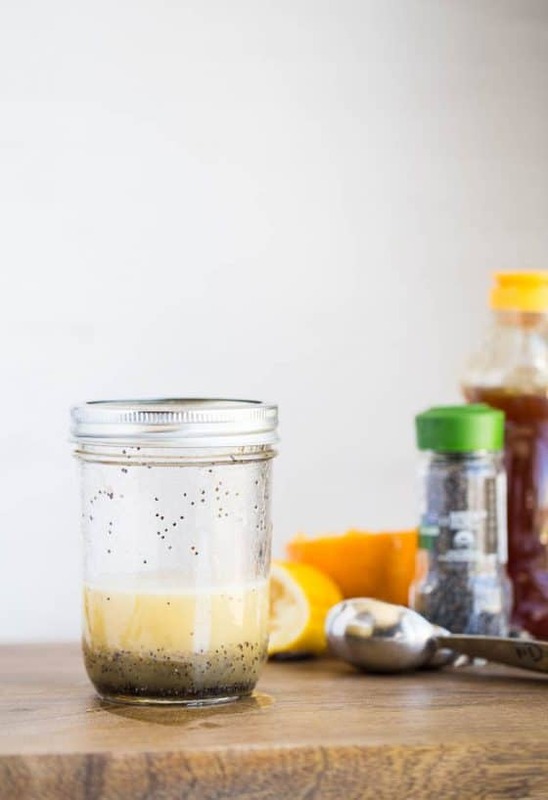 This poppy seed dressing has a little citrus and honey for sweetness. I used avocado oil for a neutral flavor. EVOO tends to be kind of strong sometimes. Can anyone tell me the purpose of poppy seeds? Asthetics? They have a sweet-ish smell, but zero taste. And if you start talking about opiates I’m going to roll my eyes at you. 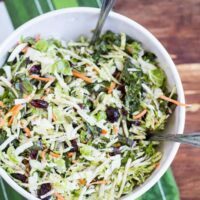 We’re still in BBQ/Potluck season so here are a few of my favorite potluck salads! Some of them are paleo, some are dairy-free, but all of them are gluten-free. This is a from-scratch version of the beloved Sweet Kale Salad sold at Costco -- with a much cleaner dressing! 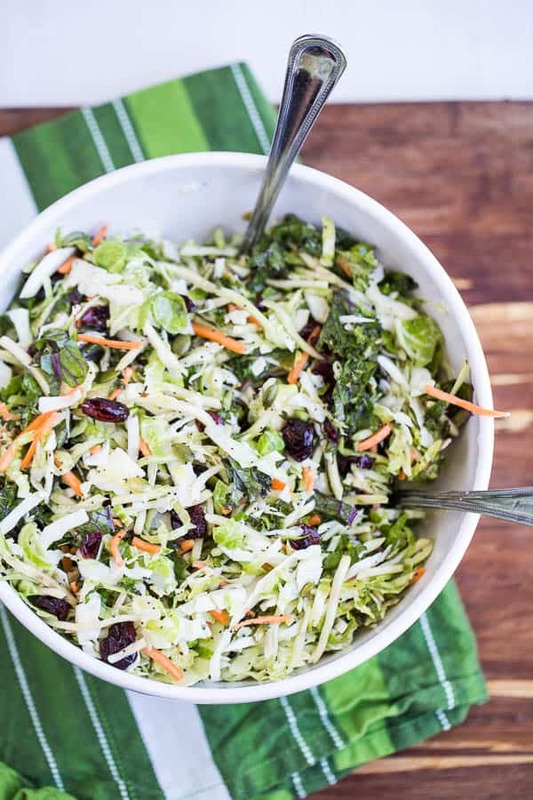 Combine the kale, cabbage, Brussels sprouts, and broccoli slaw in a large salad bowl. Add all of the dressing ingredients into a pint-sized mason jar or other lidded container. 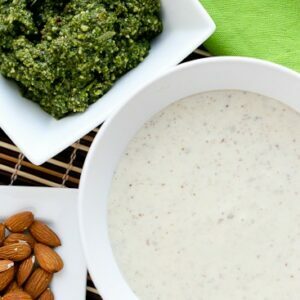 Shake the dressing vigorously to combine well. Pour 3/4 of the dressing over the salad greens. Toss the greens around to coat it well in the dressing, and then add the remaining dressing if you feel that it needs more. Sprinkle the cranberries and pepitas over the salad. Lightly toss to combine. Disclosure: This post is not affiliated with Costco. This post does contain an Amazon affiliate link. Purchases made by using these links or the search bar on the sidebar don’t cost you any extra and provide Perry’s Plate with a few pennies. Bless you for this, I LOVE those salads. I’d love to make them at home! I love the inclusion of the poppyseed dressing. I agree that they have no taste but for some reason poppy seeds are great in dressing. I love your idea of salad kits with healthy oils in it. That’s a million-dollar idea for ya! This actually turned out better than the Costco version! Thank you! 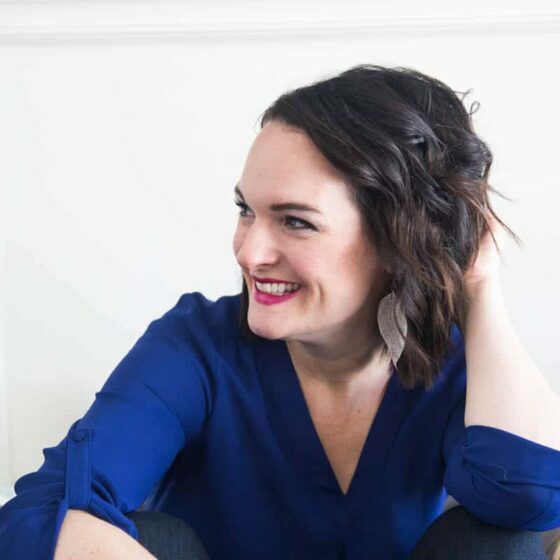 SO good to hear! Love it! Glad to find this because I love the Costco version but am not a Costco member. And, I’m trying to get my kids to learn to eat salad and kale. 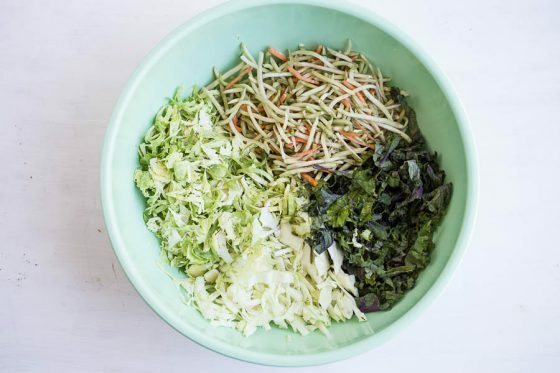 Question: what is broccoli slaw? Is that something I can make myself? Thanks. It’s a good one to start them on! Broccoli slaw is shredded broccoli stems. It looks like regular slaw and you can find it in the refrigerated section by the pre-shredded cabbage and carrots. 1/4 onion powder. Is thatv1/4 tsp? Oops! Yes, thanks for catching that. Dressing is fab! Was short on time, so I bought the usual packed kale salad and then tossed with your dressing!! So much better. I’ve done that, too! I’m so glad you like it. Call me crazy, I use them in a few of my salad dressing recipes and I think the poppy seeds add a little sweetness to them. Maybe all in my head…. lol! Ha! Might be! It sure makes it pretty, too. Honestly? I just get whatever ones are at the store with the least amount. I figure there’s only a handful in the entire salad and maybe 4-5 cranberries in a serving of salad. That’s not that bad. But if it still bothers you, you can always substitute with blueberries or halved grapes. Has anyone tried quickly frying up this salad and at the last minute putting a drained can of salmon or tuna? I have even used left over chicken. We use a very good balsamic vinegar for the dressing. Being on diets we have both enjoyed this for our lunch and we both as you probably can attest to get tired of cold salads. Enjoy! Just made this for dinner tonight. I used the Trader Joe crunch collection with kale Brussels Sprouts, green and red cabbage. It was so easy! I added hemp seeds and sprinkled nutritional yeast in it. I could eat the whole bowl of this!! Delicious! Delicious! Adding hemp & nutritional yeast is a great idea! Thanks for the info, Maryann! I definitely don’t buy bulk spices at Costco for that very reason. I actually have some poppy seeds from Morton & Bassett and they still don’t taste like anything to me, so maybe you’re a super sensitive taster. The dressing already has citrus juice (lemon & orange) as well as ACV. Thanks for that tip. Maryann – What brands of spices do you recommend? I usually use McCormick or Trader Joe’s. Thanks! Glad to have this recipe for kale salad. I always throw the salad dressing and the cranberry/pumpkin seed mix away since I dislike sweet salads (weird, I know). 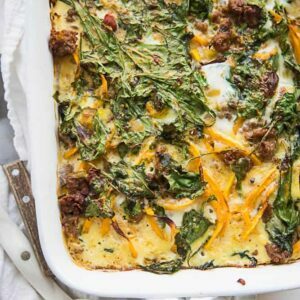 This way I can make my own without the sweetness, but I do add salted pumpkin seeds and cherry tomatoes. Thank you for this and the generous sharing of all your recipes. I love that salad but don’t buy it because the nutrition in cut or shredded vegetables starts to degrade once the veggies have been cut. Therefore, best to prepare them just before consuming (or at least prepped at home when they haven’t been sitting in a bag for a week). So I am going to make this right now as I happen to have all ingredients in my fridge…yahoo! May I ask about your Cuisinart food processor. I like my old vintage one but it’s too small for big batches. I like to make pie pastry with six cups of flour and 1 pound of butter, etc., and then have it handy in the freezer. Would this 9 cup Cuisinart be able to handle all that ? Do you happen to know the nutritional values of this salad? Hi! Sorry, I don’t. You could definitely plug the ingredients into an online calculator, though. What kind of kale do you use? The kale in your pictures almost looks purple – very pretty! I am only familiar with the large, plain giant leaves from kale bunches… either flat or curly. Did yours just happen to be a bit darker? Also, do you most often use bagged kale salad or buy a “bunch” or kale? I like to use lucinato kale, which is darker green. Sometimes kale can be a little purple-ish, too. I always buy the bunches and chop it myself because the pre-chopped, bagged kale usually has a lot of rough, thick stems still. Some people might not be bothered by that, but I don’t like chewing on them.